LONDON -- With a little British pomp and a lot of British pop, London brought the curtain down on a glorious Olympic Games on Sunday in a spectacular technicolor pageant of landmarks, lightshows and lots of fun. LONDON — With a little British pomp and a lot of British pop, London brought the curtain down on a glorious Olympic Games on Sunday in a spectacular technicolor pageant of landmarks, lightshows and lots of fun. The Spice Girls staged a show-stopping reunion, and Monty Python’s Eric Idle sauntered through “Always Look on the Bright Side of Life” — accompanied by Roman centurions, Scottish bagpipers and a human cannonball. It all made for a psychedelic mashup that had 80,000 fans at Olympic Stadium stomping, cheering and singing along. Organizers estimated 300 million or more were watching around the world. The headline performers were each paid a pound, a little more than $1.50. The night ended with the extinguishing of the multi-petaled Olympic cauldron and a supercharged rendition of “My Generation” and other classics by The Who that had the crowd dancing in the aisles. Confetti rained down, and fireworks lit up the sky. Prince William’s wife, Kate, and Prince Harry took seats next to Rogge. They sang along to “God Save the Queen.” There was no sign of the queen herself, who made a memorable mock parachute entrance at the July 27 opening ceremony. Following Olympic tradition, the 10,800 athletes of the London Games marched in as one rather than with their nations, symbolizing the harmony and friendship inspired by the games. The ceremony had something for everyone, from tween girls to 1960s hippies. The face of John Lennon appeared on the stadium floor, assembled by 101 fragments of sculpture, and just as quickly gave way to George Michael, Fatboy Slim and Annie Lennox. Eight minutes were turned over to Brazil, host of the 2016 Games in Rio de Janeiro, which delivered an explosion of samba, sequins and Latin cool. 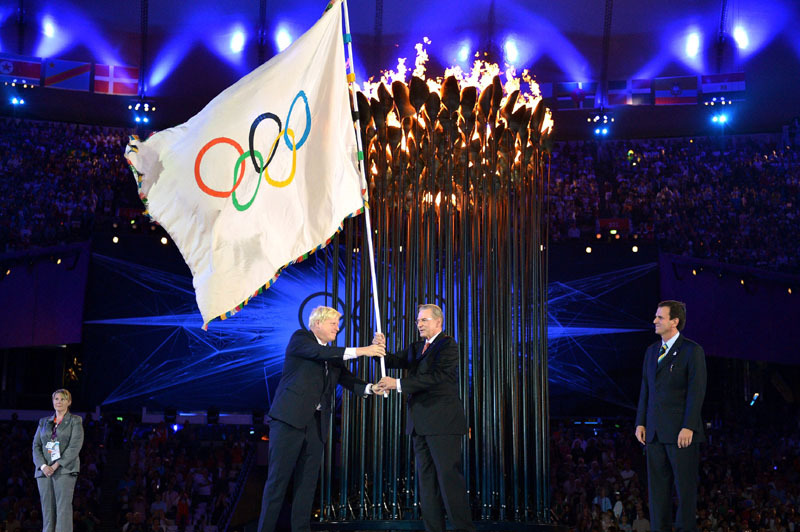 Following tradition, the mayor of London handed the Olympic flag off to his Rio counterpart. While the games may have lacked some of the grandeur of the Beijing Olympics in 2008, there were more than a few unforgettable moments.